What is it about tree roses that make them so special, what is the story behind them, why are they tree roses? A tree rose is rose bush that is essentially elevated on top of a “tree trunk” which puts the beauty closer to eye level. Tree roses give an old fashioned and classic feel to almost any garden. They add color, elegance, style, tradition, and a feeling of warmth to your outdoor room. Many varieties have a wonderful aroma and are in a multitude of colors. Normally roses do not grow naturally like a tree, they do not have a single stem with a network of branches arising on the top, instead they grow as a multi-branched shrub. Tree roses are indeed man-made, they have been modified to grow in the form of a tree. I will walk you through the process so you will have a better appreciation and an understanding of what a tree rose really is. Is it a tree or is it a rose, maybe it is both or not really? Most people know a tree as something that grows really tall, has lots of leaves, long branches, and provides shade. A tree rose is not like a traditional tree but instead they are called standards. A standard is a shrub grafted or trained on an upright single stem in the form of a tree. Most people call them tree roses, but they are really known as rose standards. So here’s the skinny on tree roses. A tree rose is created by grafting a long stem onto hardy rootstock then grafting a rose bush on top of the stem. Grafting is used to join parts from two or more plants so that they appear to grow as a single plant. Most types of roses can be used for this procedure. Below is a little background information about tree roses. Tree roses were developed in the late 18th century in Europe, probably Germany or France. By the early 19th century there were several nurseries in Germany that specialized in providing the root and stem stock for standard roses. They were widely grown in the formal gardens of France at the same time. They gained popularity in Victorian England where they were common in the gardens of nobles. The name rose standards originated there, a name that later became standard roses. To create a tree rose a rootstock and stem are chosen. “Dr. Huey” is most commonly used on the West Coast. The selected rose bush is then chip grafted to the top of the stem. Chip bud grafting is a technique in which a bud is cut from the selected variety, placed in a cut on the stem and held there with paraffin or grafting tape until it starts growing. Basically, a bud-eye is taken from the desired rose plant and grafted to the stem of a growing rootstock plant, below the bottom set of leaves. After the bud-eye produces adequate growth, the top of the rootstock plant is cut away entirely, leaving the desired plant growing on the roots of the under-stock. A hardy rootstock such as Dr. Huey is trained up to provide the “tree trunk” for the tree rose. A rose bush of the desired variety is grafted to the top of the 3 foot cane stem. Professionals graft the rose on stems that have no foliage on them. 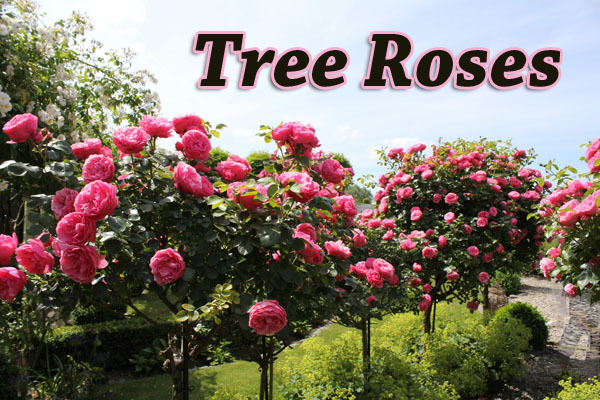 The most popular 36-inch tree roses have four grafts at the top making for an awesome display. You may be wondering what is Dr. Huey. Dr. Huey is a hybrid Wichurana rambler, (climber) that was bred in 1914 by Captain George C Thomas (a botanist) and introduced to the public in 1920. This very vigorous rootstock does well in our alkaline soils, it propagates easily, it has a long budding season, the plants harden off and ship well, and is generally adaptable to a broad range of climates and soils. As part of the routine care, It is always important to remove root stock growth (suckers) from the rose tree, failure to do so may result in decline or death of your beloved tree rose. A recommended way to remove suckers that arise from the soil is to use a trowel and scrape away the soil to expose the origin of the sucker, making sure the sucker arises form below the bud union (a bump where the cane meets the rootstock). Then pull the sucker out and refill the hole, gently firming the soil around the plant. If a sucker forms on the stem, simply snap it off (without damaging the tissue) or pare them cleanly with a sharp knife. When planting a rose tree, it is wise to plant no deeper the the recommended depth and the hole should be wider than the root ball and slightly deeper. The bud union should be just above ground level when you have back-filled the hole with soil. As the plant settles, the bud union should end up level with the ground. Give your plant a good start by mixing some bone meal or organic rose food into the soil at the bottom of the hole. When you go to the nursery tree roses are always staked up because the placement of the graft makes tree roses top heavy. When the grower stakes up the tree rose they tie both the stem and the lower part of the shrub on top to the stake. I recommend to re-attach the stakes that came with the tree.There needs be a buffer between the stem and the stake. The stake should never rub up against the stem, tie the stake in a figure eight pattern with a flexible tie with one loop around the stake and the other around the cane. We have a variety of tree roses that a starting to leaf out for you to choose from at your favorite Green Thumb Nursery.